To ensure the proper operation of your treatment plant, servicing is indispensable. This allows the plant to function for a longer period of time, and safeguard against pollution incidents. Whether it’s for domestic or commercial use, wherever you are in the UK, we service every make of sewage treatment plant and effluent system. Our prices start from as low as £89.70. We are also able to service all types of pumping stations. Every make of treatment plant has its own suggested frequency of service and desludge – to find out what your make needs, check out our handy desludge and servicing frequency table. We make sure to carry out all of our services in accordance with the guidelines of the manufacturer, as well being in accordance with British Water. So that you feel even more comfortable in using us, the entirety of our engineers have passed the British Water ‘Maintenance of Small Sewage Treatment Plants’ accreditation course. We carry an extensive range of spare parts in our service vehicles if you require any small repair jobs during your service, which we endeavour to complete as part of the service without any extra fee. So that your system is left working optimally, we will also attempt to arrange a desludge within 24 hours of servicing your tank. Phone us on 01371 504 048 to book yourself in for a service or to contact us for any assistance or information you might need. 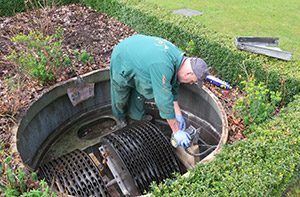 Covering the South East and East Anglia, our qualified service engineers are able to service all makes and models of sewage treatment plants. With well stocked vans, we always aim to repair any treatment plant within the visit. To discuss your requirements, call us on: 01371 504 048 and one of our friendly team will help.